Does your organization value and entertain employee learning and development as a “strategic differentiator”? Or does your company see employee Training & Development as just another cost?Your workforce becomes your competitive advantage!Staying active, updated and reorganized are the key elements to thrive success in this competitive era.Supporting your employees’ training can help you meet your business objectives and help circumvent future workforce challenges while advancing your core skills. The key to this is encouraging investments in employee learning and skills development.Outsourcing training & development and relying on training companies is viewed as an increasingly attractive prospect to align your workforce towards your business objectives. Your employees might not feel personally motivated to achieve your business objectives, such as increasing sales, expanding into new markets or creating high-quality products or services. By aligning company goals with employee, an organization can be more productive throughout the year. Corporate Training Companies with expertise in the training sector offer world-class Corporate Training services with a unique model that is focused on workforce needs and experience. Every Training Module that they offer is developed to meet the requirement of the specific company, while incorporating the company’s philosophies, vision and culture, into the presentation. A trainee acquires new knowledge, attitudes and better skills and applies them in job work or task successfully and productively. •Empower Workforce to make right decisions- Very often, decisions move up the management chain to the workforce who has the least knowledge to make the best decision. If you have a smart and well-trained team, you should empower each employee to make the right decisions. In addition to speeding up decisions, this will also instill a sense of ownership throughout your entire team which in turn backing the Company’s ROI. •Embrace Self Interest- In the end, people will always do what’s in their self-interest. Organized corporate training and learning programs help your employees align their own self-interest with organization-interests. 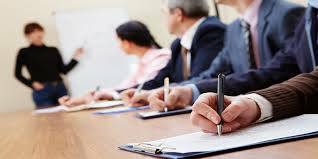 In fact Corporate Training can transform the employees and inculcate all the competent skill that is required to represent the organization to the Global business world. •Benefit employees in the long run- Training Programs are smartly conducted by highly skilled, professional and experienced trainers. It aids in improving competitive skills to match the new trends and industrial requirements, henceforth, it is in the best interest for the employees of the organization in the long run. •Increasingly, adopting new corporate hierarchies– Particularly when the employees are competing internationally. Investing in Corporate Training Companies can also build virtual teams as needed, comprising individuals with the proficient and the right skillsets. This allows businesses to be far more responsive to Global market changes. Plus, it assists the professionals to remain abreast, updated and competitive in their field. •Bolster creativity and confidence- Extensive and well-planned training program can support your employees in confidently pursuing new ideas and get the confidence back eventually. Continuous knowledge advancement improves productivity and ensuring smoothness in core business functions. Such companies provide inspiration and help workforce remain competitive in the ground of the dynamic environment. •Aligning your workforce increases employee morale- Responsive, world class and cutting edge training solutions offered by Corporate Training Companies in india an ideal way to develop your employee’s competent skills and morale.Increasing of employee morale automatically improves their retention. It also creates ownership in the organization’s success, resulting in more engaged employees. •Decreases necessity for supervision- Moreover, the benefits of organized,cutting-edge and best training programs are that the employees who are trained need lesser supervision than those who aren’t. Moreover, such companies also strengthen the current level of competencies, work effectiveness and professionalism of the employees. The productivity and profitability of the company can be directly traced to the performance of your employees working to achieve individual goals, which in turn, support your business goals. With the help of leading-edge Training solution, organizations can easily achieve swift growth in terms of both revenue generation and business expansion.